For most of us climbers, adventuring and living in the Pacific Northwest is to feel a sense of pride that most of our outdoor ambitions can be realized locally, within a days drive. 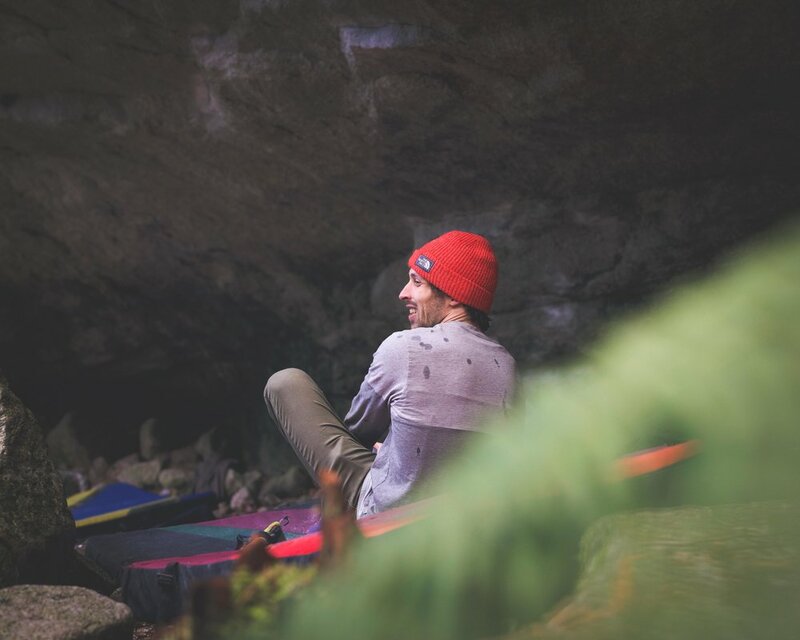 We know the feeling of having spiring mountain ranges to climb, awesome crags to project and bouldering zones that gives us some of the best quality lines in the US. We can have long, harsh and wet weather windows. Thus we expect a lot of ourselves and from our plans, when the weather opens and gives us a chance to go out. We are surrounded by a lot and always enjoy that sense at our fingertips. Few places, we feel, can provide everything our Pacific Northwest environment has to offer. It is a densely-adventurous region, that seems to be matched perfectly, with one densely-adventurous northern town—Squamish. Just manageable for long-day trips, the drive for us coming from the U.S. is almost as memorable as the destination itself. Cruising through ranging farmlands, mountains and along stretches of water inlets, taking it all in is best done with the car windows cracked wide open. The town lies at the head of myriad multi-sport options, from climbing to skiing, from backpacking to base jumping. Narrowing down your activity in a limited time window may seem daunting, but for the next few months we can focus on some amazing rock! Entering into the quaint town of Squamish is a treat. Perhaps, not so much the town itself, but rather cresting the last hill into town and arriving at the foot of “The Chief” looking over the city in all its massive-glory. As a climber, it is at that moment you know you have arrived somewhere special. At first, the magnitude of multi-pitch possibilities seems massive and exciting, while bouldering in the forest floor seems less apparent. Perhaps because of its stature in the area. Looking below a huge, beautiful rock and wondering what lies within the forests seems almost an afterthought. After gassing-up with black coffee in the day’s early hours, you will park generously close to a zone of choice. Grabbing your share of pads and beginning to saunter, navigating through the typical small crowds of people, you may experience some second guessing as to the logic of coming to such a popular place. As you walk under the forested canopy the boulders make their presence. Many first timers will pick a variety of classics to tick down as they experience the texture, complexity and diversity of each problem. Others will line up to retest their skills on ultimate hard lines, some rarely repeated. A good option for most is to start with ‘Easy in an Easy Chair’ aka ‘Easy Chair’, an area classic. 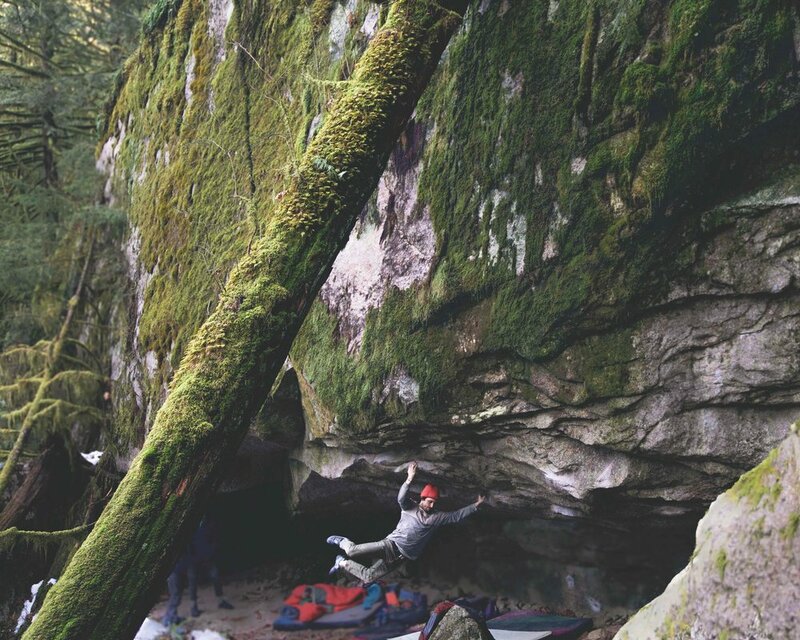 Many popular bouldering destinations have limited options in the type of problems you can try. For this wondrous place in the woods, your style can be accommodated to, but can never be made an excuse. If you are climbing mid-day, out-of-season, consider yourself lucky. You will likely be alone. In season, however, expect to be in a short queue. Do not stress, locals are wonderful and the experience collectively will be worth the wait. Although my path lies on the big walls and above in high-alpine settings, my first climbing experiences in Canada were for bouldering. 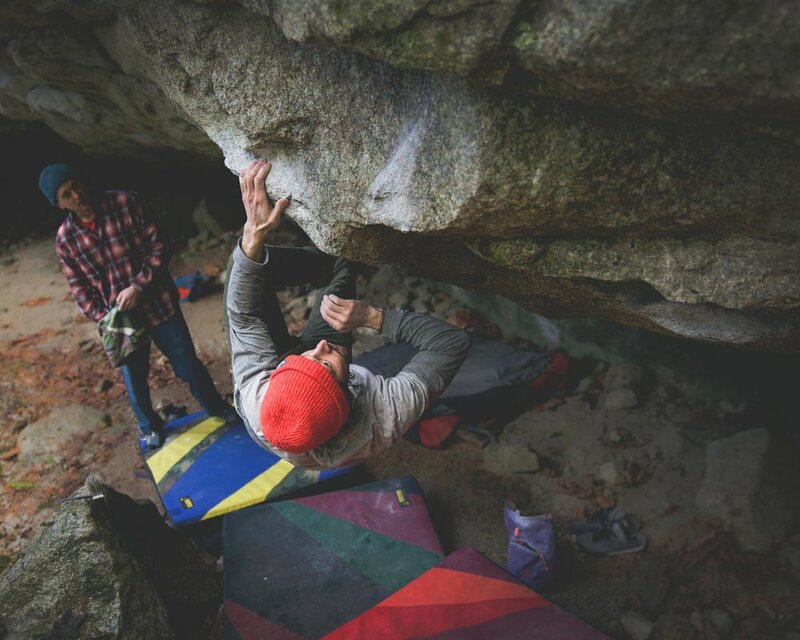 From day-trips projecting, to weekends spent entirely snapping shots, the Squamish bouldering zones are certainly diverse and impressive enough to leave you in in awe, standing within. These day and weekend trips easily can become regular. Out of season, any opening in the often finicky weather window, even a slight chance to give reps to anything dry, will seem totally worth your time. Given the immensity of quality problems concentrated within a short approach, the first true issue maybe related to skin, as over-excitement often translates into voluminous reps up enticing lines. The boulders will eventually win and with that, the planning and anticipation for a follow-up trip will begin. 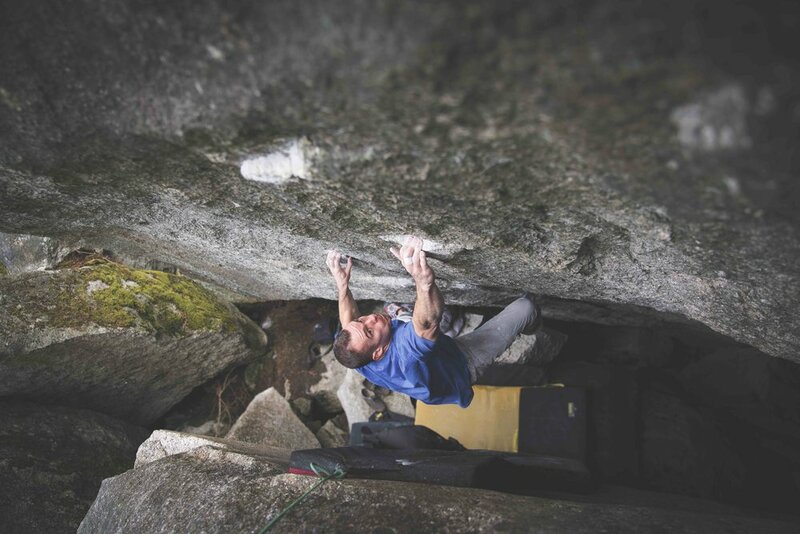 The experience of Squamish and broadness of the area's bouldering can hardly be matched by anything less than entire regions. Spreading throughout the forest and skirting around giant zones, you may choose to hangout on area classics or to explore further on major test pieces. In any event, you will never be lost from the amazing local environment and not be isolated from others pursuing enjoyment on some amazing rock. It would seem then, the only issue that presents itself is whether to grab your trad-rack, skis, backpack or crashpad? Anyway, you can always hang at Mags with everyone else and ponder-away your decisions….